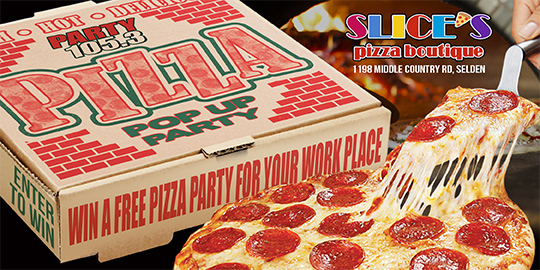 Party 105 and Slices Pizza Boutique in Selden are teaming up to hook your work place up with a pop up pizza party. Every Friday morning, Just Joe and Mezzy on the Wake Up will announce a winner and will personally deliver lunch from Slices Pizza Boutique in Selden, along with some great Party 105 swag to the winning crew. Your registration information is for the use of WPTY-FM only. We collect information in order to keep you informed of contests and events sponsored or promoted by WPTY-FM. WPTY-FM will not sell, rent or in any way distribute personal information supplied to us by you. The information you provide us stays with WPTY-FM only.